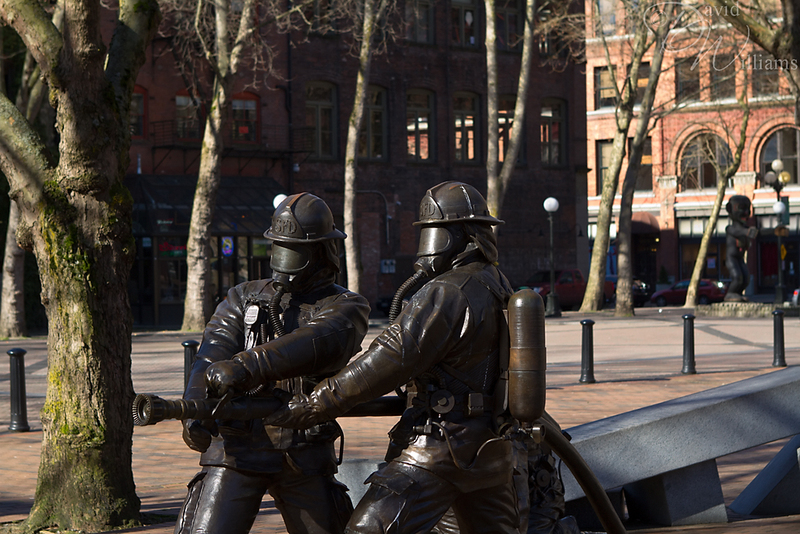 There’s a memorial in Seattle’s Chinatown International District which was inspired by four firefighters who lost their lives during a warehouse fire in 1995. Although it was inspired by those four brave souls, it’s a tribute to all the firefighters who have lost their lives in the line of duty since the SFD was established in 1889. If you are in Seattle, they can be found in Occidental park. To read more (and where I found this information), please visit the >>SFD’s memorial page<<. Was there a 3rd in the background? I love memorials like this. Its so heartfealt. Nice David, it lacks a little of the pizazz I am accustomed to from your shots, but as a tribute, its really nice 🙂 Great detail in the statues! You really did a good job capturing the colors of the memorial. In all of my shots they looked black. Thank you Mike, I was pleased how it turned out.